While I’ve been making an effort to keep it more positive on the blog (mainly by sticking to the subject matter of classic comics that I love), sometimes I feel compelled to cover unpleasant topics. This is one of those times. About eighteen months ago, I was wondering if the initials “DC” might actually stand for “Dying Company.” Now it appears it’s Marvel’s turn, as per this Newsbeat article by Brian Hibbs, published a little over a month back. By the way, just a quick note here to DC: Don’t get cocky. This “Dark Multiverse” event you’ve got lined up sounds like it might be a disaster as well, which would likely put you right back to where you were a year and a half ago. Hibbs brought up the Marvel Zombie—remember this creature? A beast that once ran wild in massive herds across newsstands, drug stores, and comic shops throughout North America in the sixties, seventies, and eighties. Today, sadly, there are just a figurative handful left—if that. As Hibbs points out, Marvel’s business policies have a lot to do with the extinction of this species. Seriously now, six Avengers books a month? …And at four bucks a pop? A person would have to hate themselves to want to buy all those comics. Sidebar: It’s kind of funny that even though Martin Goodman sold the company nearly half a century ago, they’re still using his old business strategy—which is to flood the market with whatever’s hot. Remember when there were mutant books and X-Men variations all over the place in the late 1980s and early 90s? Over the course of entire GENERATIONS, regardless of who’s in charge, Marvel can’t seem to help making this same mistake over and over. It’s no coincidence that they did their best business when DC tied their hands, distribution-wise, back in the sixties. “Event” series that are billed to “change everything!” are another problem, as Hibbs notes. These “events” tend to add even more complicated layers to a continuity that was already too complicated to begin with. After thirty-plus years of gimmick events “changing everything,” no one can keep up with what’s going or who’s who anymore—moreso, no one even wants to keep up. Reading comics becomes this big headache that’s not even fun anymore. Comic stunts like these may offer a short-term sales bump, but they erode the readership base over the long term because of said headaches left in their wake. That flood of Avengers titles serves as a perfect example. I would bet none of the teams in any of these titles resemble the team of Avengers seen in the hit movies. So if you’re a fan of the movies and want to check out the comics because of that, you will find none of the characters you loved from the films. Once you realize this, there’s no motive left to buy the comic. Then, if you’re an old-time, classic comics fan (like me), why would you want to waste money on new comics when the characters you grew up loving are nowhere to be found in them? In some cases, there may be characters with the same names and the same costumes… they may even ostensibly be the same characters but they’re not really the same. This is because they keep changing characters, changing costumes, changing identities, killing them off, and bringing them back to life again. And every time they revert back to the status quo after one of those “change everything!” events, something is lost. Case in point: although I stopped buying/reading them a long time ago, I spotted a review of one of the new Avengers books and saw that (apparently) Doctor Doom is an Avenger now. I forget exactly what it said, but I think he was supposed to be the new Iron Man. Or maybe Iron Man was the new Dr. Doom…? Something along these lines. In any case, it was really stupid. In the end, both Doctor Doom and Iron Man are lost to us. I get into debates over this with fellow fans from time to time. Some insist that characters should change, they should age; that it’s ridiculous that they don’t. I disagree. Not that I think they should be completely static, but at their core they should remain who and what they are. This was actually Marvel policy when the line was near its height, creatively and financially. And again, I don’t think this is a coincidence. 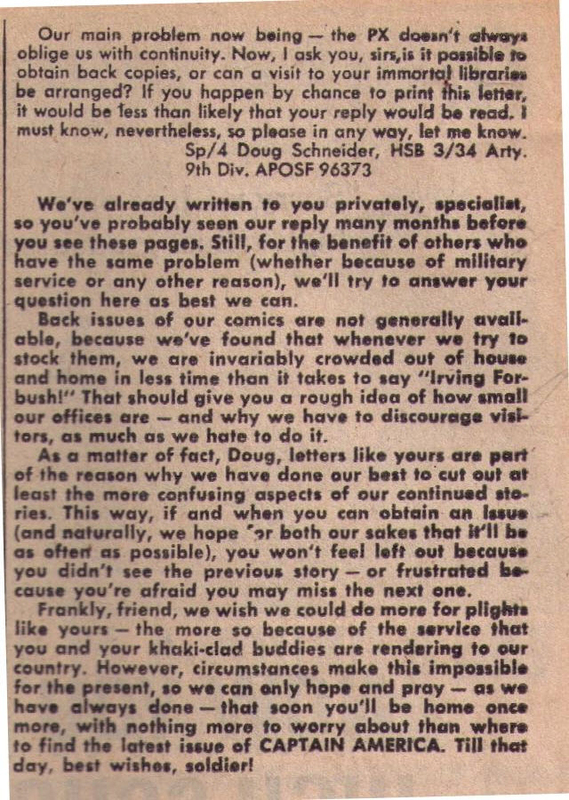 In the lettercol of Captain America #121 (Jan. 1970), a young soldier wrote in to inquire how he might best keep up with the comics continuity, since his PX didn’t stock issues consistently, and wondered if Marvel sold back issues. The Marvel response was that they were doing their “best to cut out at least the more confusing aspects of our continued stories. This way, if and when you can obtain an issue (and naturally, we hope for both our sakes that it’ll be as often as possible), you won’t feel left out because you didn’t see the previous story—or frustrated because you’re afraid you may miss the next one.” In other words, they wanted to be accommodating for new readers. In the present day, the continuity is such a confusing mess it makes it almost impossible for new readers to get started. In fact, if one didn’t know any better, you’d think they were purposely trying to push them away. Some quarters are suggesting that Marvel’s efforts toward diversity are what’s hurting sales. I don’t believe this is the case. The problem is not diversity; I believe the problem is Marvel’s approach to the issue. It’s not that people don’t want diversity. What they don’t want are insincere, empty nods toward diversity—which is what Marvel is giving us. Taking an existing, white male character and simply changing their race and/or gender is a blatantly cheap gesture. You want to impress people? Then put in the WORK and create original characters that were made to be that gender and/or race. Don’t give minority and oppressed groups your white male hand-me-downs, because that’s insulting—in addition to being just plain lazy. Here’s a personal example of how this approach can backfire. As should be obvious from the last couple of blogposts, I was a Wonder Woman fan as a kid. I really enjoyed the new Wonder Woman movie and was rooting for it to be great; rooting for it to succeed. But I can’t see myself rooting for Marvel’s Captain Marvel movie when it comes out in nine months (or whenever it’s scheduled for release). That’s because, for me, the Captain Marvel of Marvel Comics is, now and forever, Captain Mar-Vell, formerly of the Kree, and the original “Protector of the Universe” who fought Thanos the Mad Titan in the early-to-mid seventies. That Thanos storyline—one of the greatest in the history of comics—will be reprinted and re-released for as long as the planet Earth is spinning, which is likely why Marv will always be the one, true Captain not just for me, but for any passionate comics fan. Now if you wanted to change Ms. Marvel’s name to make her more independent from the original Captain, I might understand… I would disagree with it and dislike it, but I would at least understand the logic behind it. (Just don’t call her Warbird, okay? Because that name was really awful. What the hell is a “war bird,” anyway?) Taking the name “Captain Marvel,” however, feels like a step in precisely the opposite direction. Instead of distancing herself from Captain Marvel and asserting more independence, it’s like her identity is being swallowed up in his entirely. Why would Carol Danvers do this? Why would she want to? Circling back to Wonder Woman: This is why her solo film debut was such a big deal and garnered such a huge response from the female audience. Wonder Woman was the first costumed superheroine to star in her own title and her identity was her own. She didn’t take her name, costume, and powers from some previous male superhero named “Wonder Man.” Wonder Woman is an original, a pioneering character—the real deal. Same scenario with Luke Cage when his show premiered on Netflix last fall. African American viewers were particularly excited by it because Luke Cage belongs to them; was made for them. And I have no doubt we’ll see a similar response from this audience when the Black Panther movie comes out in February. So I fully support the effort to diversify the line, but I’d like to emphasize the word “effort” here. Put in the man hours, people; do the WORK. Do what artistic and creative people are supposed to do—CREATE. Recycling and re-purposing established characters is a cheap cop out that always fails anyway. Quite frankly, the superhero genre could use the fresh blood that new characters would bring to it. It’s not only the right course from an ethical standpoint, it also makes good business sense. Getting back to Wonder Woman yet again (in addition to getting back to my earlier point about static characters), a big reason for the film’s success is that director Patty Jenkins did not try to reinvent the character. In fact, she made a conscious choice to stick close to the character’s traditional roots. The comics need to take this same approach with all of their iconic characters. Enough with the pointless changes and fake deaths and making Captain America a Nazi. Let the characters be “every glorious thing” they are, and concentrate instead on telling a quality, fun story. Sounds simple enough. Will they ever do it? Probably not. But whatever happens, I needed to get this off my chest. Let me balance out some of the ranting with some good stuff (or at least potentially good stuff). Back in February it was announced that Casper the Friendly Ghost was returning to comics—news that made my heart weep tears of joy. Now I haven’t seen copies at the comic book store yet, but I’m keeping my fingers crossed that this still happens. Then there was this news of indy publisher Alterna Comics trying to revive newsprint publishing at a cheaper price. Not sure if this will prove successful, but I so, so, so admire the effort. And finally, it looks like The Elementals might be making a comeback courtesy of Dynamite. It’s all still speculation at this stage, but this was once a great comic series back in the 80s. Tell me original creator Bill Willingham will be involved somehow and I’ll be over the moon.